-UTAH'S UFO RANCH Additions- IS IT A MARA? Visitors views: STRANGE ANIMAL related to CHUPACABRA? What happens when ordinary folks, not bound by any allegiance to NIDS take a walk up that way? Information on Chemtrails in Utah The Chemtrail Secret Agendas, Dugway's Open -Air Involvement, The Media Cover-Up, Weather Effects, Health Concerns and Controversy. Utah's Little Grand Canyon Beautiful photos! l Eagle Mountain Bigfoot? - PHOTOS! The doormat on the front porch says,. "All Species Welcome,"
A Utah couple in contact with the "Elohim"? the story is impressive, filled with spiritual, high tech, ancient, 'ET's' showing themselves in the reflections of a dusty TV and said to be training for some unknown event. During our investigation - no strange or paranormal activity was witnessed. but check out the interesting photo results! l X-Craft at Michael's AAF Dugway, Utah -UUFOH 1/02/04 UUFOH Exclusive! UUFOH Follow Up Report: UUFOH Investigators looked into this case, met with witnesses and acquired a copy of the footage shown on the Channel 5 News broadcast. Taken by KSL cameraman Jen Pilgreen with a Sony Betacam DNW7 camera in 16X9 format the footage shows it to be a blimp of some sort, with a propeller in the rear and some box-like objects in front. Several UUFOH Team members had their eyes aimed skyward, seeing UFOs over Utah. CLYDE LEWIS OF GROUND ZERO FEATURING UTAH INVESTIGATORS. New photos of Chemtrail activity over Utah, taken by UUFOH members, from Beck Street, Cedar City, West Valley..... The Spraying Must Stop! Demand Action! Write your Senator! l OK.... Who's Playing god? -UUFOH "What The Bleep?"! "Sen. Hatch might want to see what's in his own backyard! " l UFO Seen & Photographed at Area 51 Skywatch! in the segment "From Outer Space" by Steve Baron - Alien Dave comments on the possible hazards of the NASA capsules landing in Dugway. 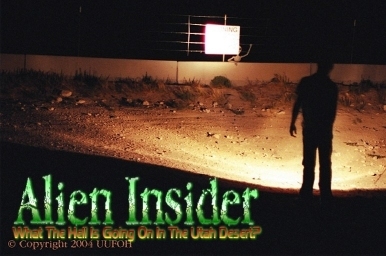 l Alien Insider© What The Hell Is Going On In The West Deserts Of Utah? Fine Arts Film Studios and the Utah UFO Hunters organization have joined together to produce a two hour documentary on sightings of unexplained phenomena throughout the State of Utah. l Unknown Animal Update - Photo Comparisons Blue Chupa? Photo comparisons of "Ranch Animal' & other unidentified animals reported. Informative Utah Bigfoot Article originally intended for City Weekly,. is now being featured on aliendave.com! Exclusively!